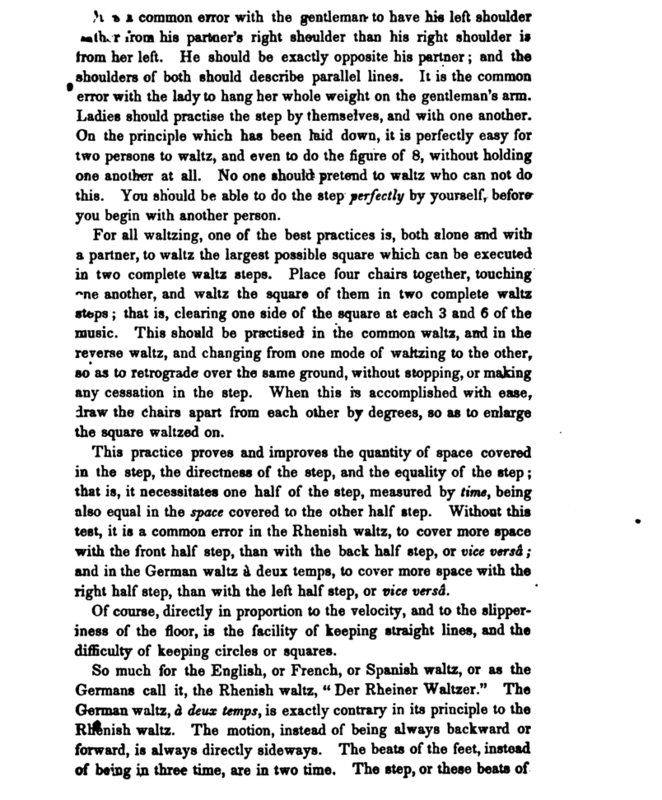 This is an odd variant of the 19th century Waltz, from Count Alfred d'Orsay [Charles William Day]'s Etiquette: or a Guide to the Usages of Society (1846). One can scarcely conceive of the agonies which I have suffered in observing my countrymen making themselves ridiculous by their attempts and failures in the art of waltzing. But it is quite impossible to imagine the martyrdom which I have endured in observing my countrywomen making themselves ridiculous in the same way. 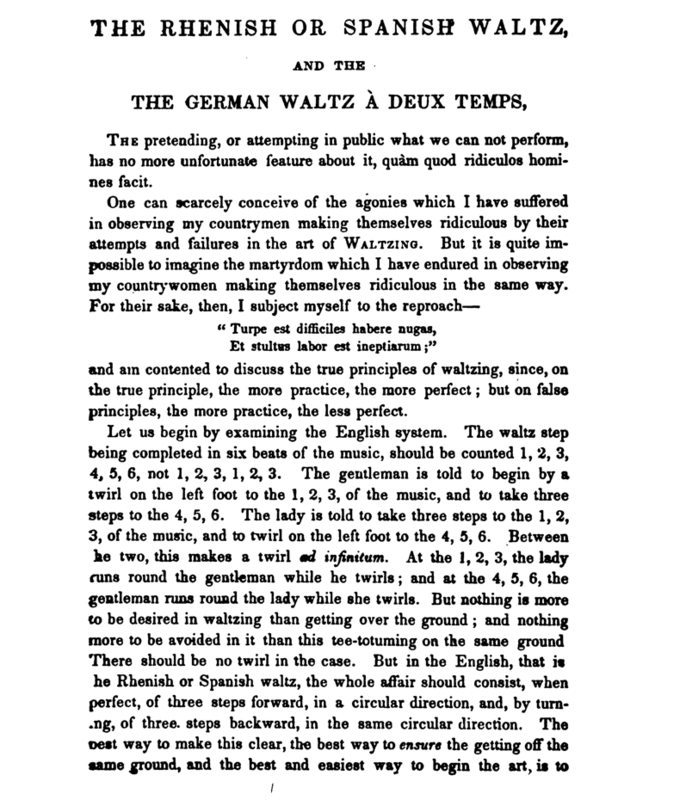 Then he describes the original pivoting waltz step: "At the 1, 2, 3, the lady runs round the gentleman while he twirls; and at the 4, 5, 6, the gentleman rounds round the lady while she twirls." He concludes, however, that "nothing is more to be desired in waltzing than getting over the ground; and nothing more to be avoided in it than this tee-totuming on the same ground. There should be no twirl in the case." 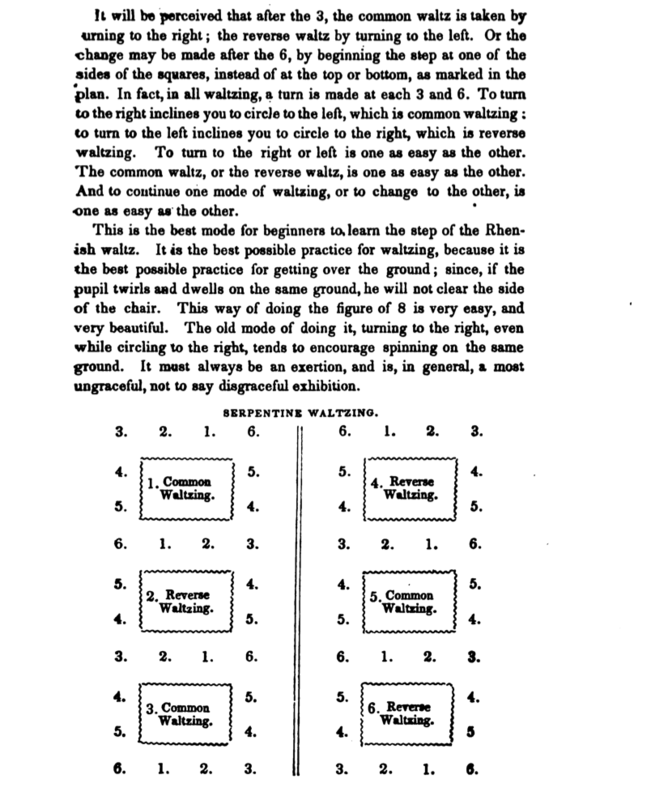 Instead, Day writes, "the whole affair should consist, when perfect, of three steps forward, in a circular direction, and by turning, of three steps backward, in the same circular direction." The Lead is instructed to take three steps back, turning on count 3, while the Follow takes three steps forward, turning on count 3. Then the Lead stakes three steps forward, turning on count 6, while the Follow takes three steps back, turning on count 6. Day notes that the Rhenish Waltz can turn either to the right or to the left. 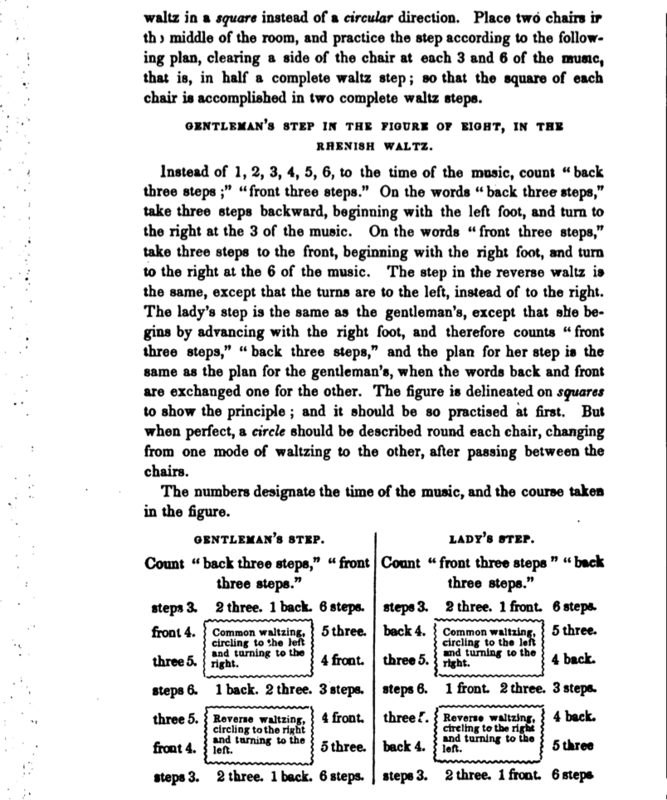 Both variations start with the Lead stepping back on the left foot on count 1. 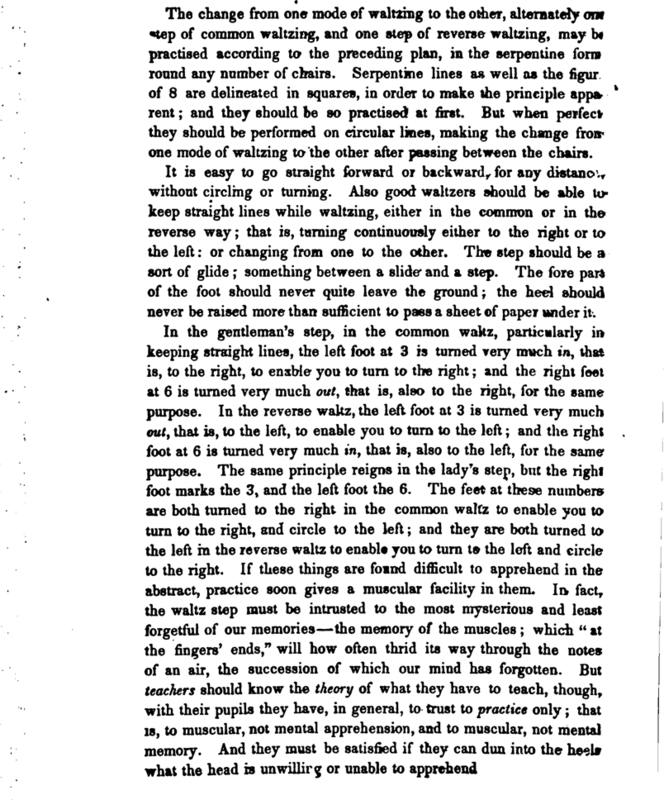 With regard to style, Day writes that "the step should be a sort of glide; something between a slide and a step. The fore part of the foot should never quite leave the ground; the heel should never be raised more than sufficient to pass a sheet of paper under it." In the end, Day's primary goal seems to be to get the waltz to travel as far as it possibly can, rather than rotating. The result is almost more of a One Step variation (60 years ahead of it's time) than a 19th century waltz, but it's a fascinating oddity nonetheless.